One good side effect of a no-spend weekend: we surveyed the garage and found materials to complete a number of projects. Would you believe we've had these pegs since we were married? We mounted the bar low enough for little hands to hang their own towels. 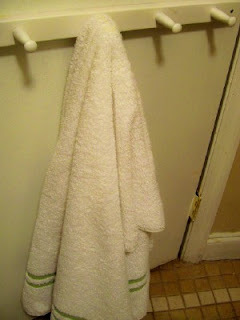 Tip: You can install a wooden towel bar on a hollow-core door by using Liquid Nails, not screws. 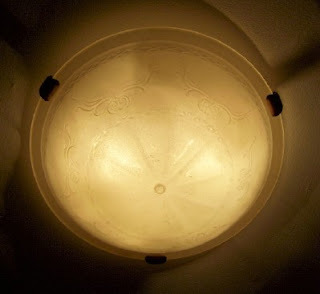 We also recycled a glass cover for the pantry's bare bulb. A little light should improve my attitude, if not my cooking! very resourceful, and great ideas! Kinda like the show Design remix. They take things people already have, and decorate with that. It is unbelieveable somethings they come up with without breaking the bank, and using things one already has! Good job Meridith! The toys on the cake is neat. I once did a Thomas the Train cake with my 3 year olds train on top.Saves money, and is homemade. Liquid Nails--now there's a thought. I'm wondering about using it to attach hooks to our plaster walls, where real nails tend to bounce out and make inch-round holes. I suppose once it's up you can never change your minds? Still, for stuff like towel and coat hooks, that might be OK. I have something like that too. That mom gave me still in package. I have not figured out where to put it till now. In the kitchen to hang towels. Thanks!